Things didn't go so well the last time you showed up to your weekly pirates' guild meeting. They complained that your sword wasn't intimidating enough, that it was "too plain" and way too "subtle." After all, a pirate's success depends on how scary he or she looks (Blackbeard, for instance, was known to wear lit candles... in his beard!). So toss away that boring old sword and arm yourself with this terrifying and not-at-all subtle Skeleton Cutlass! This thing would look dangerous enough without the added detail, with a fearsomely curved blade and that "aged" look that suggests it's seen a few battles (and done its fair share of slicing and dicing on the high seas). 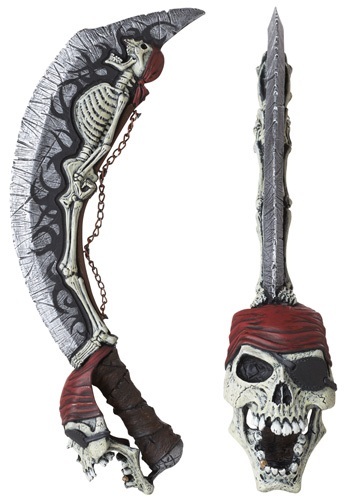 But the miniature skeleton embedded and chained into the blade makes quite the statement. As does the snarling skull handguard, which ought to be enough to send your enemies running before you even have to fight them. And best of all, the Skeleton Cutlass will be more than enough to silence your pirate naysayers!